The first memory I have of foie gras is a conversation with my parents. We were in the car. I don’t remember whether I was 8, 10, or 12, but I think we were visiting friends in the Périgord, one of the prime foie-gras producing regions in France. My parents were explaining foie gras: Duck or geese are force-fed excessively until their livers become abnormally large. These livers are prepared most delicately and the result is terribly delicious, a rare delicacy to be savored with due appreciation for what goes into its making. I was appalled, and had no idea what the dish actually was. Foie gras, a French regional specialty? I pictured a sort of liver stew, and swore solemnly never to eat it. Quite honestly, forsaking liver stew forever didn’t seem like such a sacrifice. Had I known. Later, much later, I ate foie gras, of course, and was compelled to admit that my parents were right. Now I make foie gras terrine once a year, for Christmas eve. Have all my scruples disappeared or have I discovered many shades of grey? Am I willing to forsake anything for pleasure or have I been convinced that producing foie gras is not as barbaric as it sounds? Just as I don’t eat meat or chicken raised industrially and buy eggs from pastured hens if I can, I always get foie gras from Hudson Valley Foie Gras. I believe they raise happy ducks. I am sure some will disagree. More than usual, the raw product is crucial here. In New York the best source of good foie gras is Hudson Valley Foie Gras. The tricky part about preparing foie gras is deveining the lobes. I learned it from my mother, who learned it from a friend, but I found this good video online. It’s in French but the images are self-explanatory. This recipe is very slightly adapted from one by the French chef Michel Guérard. It uses many aromatics but in very small quantities, so the taste of the foie gras is enhanced but not overpowered. When cold the foie gras is quite hard, so in order to devein it it needs to soften a little. Pour the cold milk and about half as much hot water in a large bowl (the liquid should be warm). Put in the raw foie gras and let it soften for about an hour. Remove the livers from the milk, place them on a large board, and, working carefully with the blunt side of a sharp knife, remove the veins from the liver. To do this, start at the big knot of veins and carefully follow the veins, removing as much as possible to avoid any blood stains in the liver. Place the deveined livers in a shallow dish and sprinkle with the spices and alcohol. Let marinate for a few minutes or up to 12 hours in the refrigerator (I have done it both ways and would be hard pressed to say definitively which is better. I’d make it depend on what is more convenient, logistically). Preheat oven to 250°F (120°C) and place a large shallow pan filled with 1 inch (2.5 cm) of water at 150°F (70°C). Place the livers in the terrine, and the terrine (without the lid) in the pan of water. Cook for 40 minutes, checking regularly that the water stays at 150°F (70°C) the whole time. Once cooked, the liquid fat should have risen over the livers and cover them by about 1/2 inch (1 cm). Close the terrine and let it cool at room temperature for about 2 to 3 hours, then transfer to the refrigerator. Foie gras must be made at least 24 hours in advance, is best after 3 to 4 days, and will keep for about 8 days. I love this recipe for many reasons: it’s absolutely delicious, quick to make, can (or rather should) be prepared in advance, and, well, it’s liver. I find all sorts of excuses to make it. Tomorrow it will be lunch in the country; it’s been good for parties or Easter brunch; but more simply it is the recipe upon which I fall back when we have friends for dinner and I am undecided about what to make. It helps unlock my imagination and inspires the rest of the meal. Most often I serve it with baguette as a tapas-style apéritif together with olives and nuts, radishes or cherry tomatoes – depending on the season. Trim fat from chicken livers and set aside. In a small saucepan melt 3/4 cup butter over low heat. Once melted set aside. Finely chop onion (or shallot). In a large skillet melt 2 Tbsp butter together with a little olive oil (the oil prevents the butter from burning). Add chopped onion, cook over medium heat, and as soon as it becomes translucent add whole sage and thyme and stir to mix flavors. Immediately increase heat to high and add chicken livers. After a couple of minutes the livers should be slightly brown, turn them over. Sprinkle Marsala and brandy over the livers and cook for a few minutes until the liquid has evaporated. Remove from heat and season with salt and pepper. When the livers are cool enough to handle, remove sage and thyme, transfer to cutting board, and chop finely. Place livers in bowl, add scrapings from skillet as well as the melted butter and mix well. 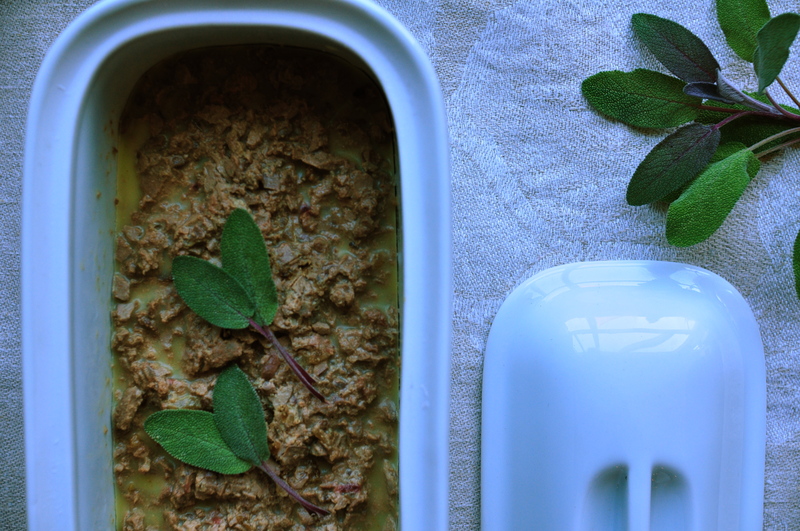 Transfer livers to a terrine dish (any bowl will do) and place in refrigerator for a few hours and up to two days. It gets better after a day or so. *The absence of Madeira or Marsala absolutely should not keep you from making this recipe. Just replace with a little brandy. On the other hand, it creates an opportunity to buy the wines, which deserve to be kept in your bar or pantry and will come in handy, for example when making stewed pears (recipe to come later this year).